This is the second in a three-part series written about vaqueo horsemanship. Vaquero Horsemanship Part 1 is the first one in the series and Vaquero Horsemanship Part 3 is the third. For those of you who didn’t catch my last post, I discussed the history of vaquero horsemanship as much as I know it. This time though, I will talk about how the snaffle bit and traditional hackamore are used in starting colts. The snaffle came to America from England and Europe and is a direct pressure bit. This means the pressure is felt directly on the sides of the horse’s mouth when you pull on a rein. 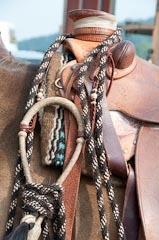 An example would be like this: say you wanted to turn to the right, you reach down on the right rein and lightly pull, this puts pressure on the right side of the mouth creating direct pressure.The general opinion among vaqueros was that the snaffle was not the ideal instrument for starting colts. They figured it was too harsh as it has a nutcracker or vise like effect on the tongue and bars of the horse’s mouth. They also didn’t want anything in the horse’s mouth in the younger years when the teeth were developing. The hackamore, or bosal, is solely the invention of the California vaquero. This is what they used to start all of their horses. 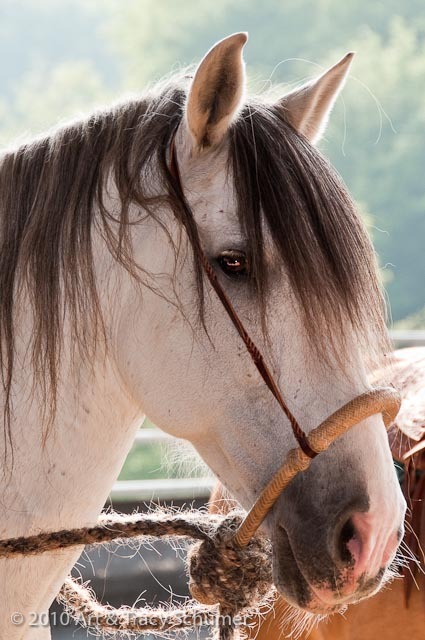 A bosal is a braided band, usually about 5/8 inch in diameter, that fits around the horse’s nose with a twisted horsehair rope about 23 feet long (called a mecate) tied into it for reins and lead rope. The hackamore works in this way; instead of direct pressure as with the snaffle, the bosal works on indirect pressure. When you want to turn right, you pull on the right rein and the hackamore pulls from the left side of his nose, bringing his head to you. Before I go on, I would like to point out that a mechanical hackamore is an entirely different piece of gear than the traditional hackamore. The mechanical hackamore is a leverage device and was invented to try and get as close as possible to the ultimate in forceful control, in my opinion. First of all, there is the band that goes around the horse’s nose, not so bad, but combine it with everything else: when you pull on the reins, the very long shanks along with the curb strap put a tremendous amount of leverage on the horse’s jaw, the bridle rings pull the headstall down on his head, and the sides squeeze in on his mouth, this is especially bad if the horse has not had his teeth floated (the sharp edges filed off) in some time because it cuts the inside of his mouth to ribbons. Sorry about my getting off on the “mack-hack”, but I don’t like them! Now that I have discussed both of the pieces of headgear used in training, I will describe how we start colts. 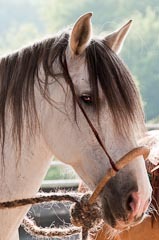 In the vaquero’s day and up until not so very long ago, horses were started at no less than five years of age. This was because after the first ride (in which you hung on for dear life until the horse stopped bucking) they could be used all day without getting tired. Today we start colts at two or three years old and in a more understanding way. The first step is to do your groundwork; free up the horse’s feet, sack him out (rub him all over and wave around him a slicker, plastic bag, etc.) and then saddle him. Once saddled, you let him get used to the saddle by letting him walk around the pen with it on. He might buck or he might not- if he does we just let him buck until he finds out the saddle won’t hurt him. After getting used to the saddle, you can step up on him and ride him; not much the first time mind you(sometimes a few minutes is all it takes) but just enough so that he feels comfortable with you on his back. Once he feels good, get off of him and put him away. This teaches the colt that riding is a good thing, not something to be afraid of. When the horse is ready you can ride him outside of the pen and begin teaching him to be a ranch horse: roping, working cattle and everything else that a working horse does. This process lasts until the horse is six, seven or eight, depending on the horse. What comes next is what I will talk about next time: the Two-Rein and the Bridle Horse. If you would like to learn about how to start horses in this way, I would suggest looking up these people: Ray Hunt, Buck Brannaman, Joe Wolter, Bryan Neubert and Martin Black, these are the best that I know of.